My son was allergic to this - it gave him a rash. This product works well for my young chicks who have fine, thin, short hair. If they had longer thicker hair, it might cause issues with tangling. Smells nice, lathers well. I really wanted to love this product since we are big fans of the other items available from GB. My daughter has quite long hair, and I find this shampoo really strips her hair of moisture and tangles it unbearably. I had to stop using it on her and am just using it for my two sons now. I think it's fine for short hair, but definitely not for girls with longer styles. I won't be purchasing it again. We love the green beaver products! This one smells great and works great! We love this shampoo and it smells great! I love this shampoo, it is perfect for my type of hair. I am in my 40's but use this because I have fine, thin hair with a tendency of being more on the "greasy" side. (I think it is just healthy because I don't colour it) It makes my hair feel nice and clean. If you have longer hair (mine isn't quite to my shoulders) it would make your hair hard to comb and knotty. It makes my hair a bit knotty but because it isn't long it isn't an issue. I don't recommend it for medium to long hair. I do recommend it for shorter, fine, limp hair. Hope this helps someone because if you get it for the right type of hair, you'll love it. I usually love Green Beaver products, but this shampoo was disappointing. It's really drying, and my daughters hair smells a bit like wet dog & grape juice after a bath. We have to use the conditioning detangler with it, and her hair is still very dry after. I'm going to use it up because I like the ingredients and it doesn't irritate her skin, but I would not repurchase. We have been using it for at least 4 years. A little goes a long way. My son plays lots of sports and so we wash his hair often during the week. Love that it is natural and free of harmful chemicals. Love this product, and Greeb Beaver products in general. I try to always support Canadian companies. A little goes along way with this shampoo, washes out well. My daughter has ezcema and it is the only product that doesn't irritate her skin. I highly reccomend this product to everyone I know. Love Green Beaver products, the kids love it too. Love green beaver. Love this shampoo as it doesn't stung the eyes and no residue left over. Very nice shampoo, with a very subtle and pleasant scent. I need only a tiny amount (less than pea size) to wash my son's hair and he seems to like it. I keep reminding my hubby that a little goes a long way with this one - excellent value! Washes out very well and doesn't leave any residue. Nice shampoo ( but can leave the hair a little dry) and a little goes along way. Also love that it's a Canadian product! I love Green Beaver products and this shampoo is no exception. A little goes a long way and the bottle lasts a lot longer than you'd think. Smells great too! Like a lot for my kids. Kids and mom love it! Just like the body wash! My kids love this shampoo. Smells great and you only need a little to get a good lather. This is the shampoo you want to use if your child has smeared something greasy in their hair, like vaseline or gravy... but for everyday use, no one needs to be this clean. It is incredibly drying and I have to heap conditioner on afterwards, and I don't think kids' hair should be so heavily conditioned. Yes it smells nice and it definitely does the job. But unless you want to end up with static and stubborn knots, I would just use something else; this is not a gentle shampoo at all. Great shampoo! Smells awesome and you only need a tiny bit to get a good wash. Definitely will be buying this product again for my daughter. My daughter loves this shampoo. The smell is awesome. I love because it's Canadian and organic! Love this product! Smells great, doesn't require much to get the job done. Will buy again and again. I love this product for my baby. I need very little for a lot of suds. I love that it's tear-free and I love Green Beaver! Very appealing smell too - I like that it doesn't really linger after though - my husband doesn't like baby to smell 'shampooy'. I love this shampoo, but think for almost ten dollars it should be a bigger bottle . Love this shampoo, order it again and again :) You only need a very small amout for lots of suds! I like that it's Canadian and natural but it doesn't lather very well and a conditioner is a must. It leaves my daughters hair in tangles and knots like nothing I've ever seen. If you try this I recommend getting the Green Beaver detangler spray. Love the smell. It doesn't sting eyes and I find that I don't need a conditioner on my girls after using this shampoo. Of course the best things about it are it's super natural and it's Canadian which is why we love Green Beaver products! My daughters loved the smell! It is a harsh cleaner though and definitely requires conditioner. I was surprised at how awful the kids' hair felt when I rinsed it out. But I guess that means that all the yogurt and peanut butter has been rinsed out too, right? After conditioning and drying the hair looks great. I like that this is a Canadian and most organic shampoo. It smells really nice! But I must agree with the other comments about it leaving hair a bit dry - I usually have to use conditioner afterwards. And I wish they didn't have citric acid in it - my son is sensitive to this ingredient so I cannot use it on him. 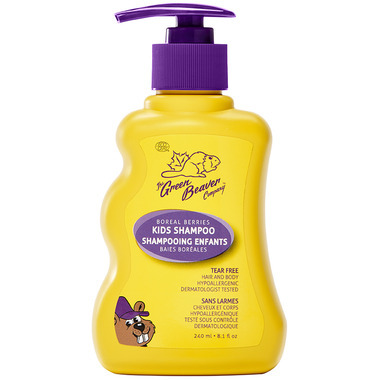 I love this shampoo for my 3 year old. She loves the beaver on the bottle and I love that it is a green Canadian product! It smells great without being too strong. I love this green and Canadian product for my kids! Love this shampoo! I am sensitive to scented products and my son has sensitive skin, but neither one of us have a problem with this shampoo! It lathers up great and you don't need very much of it. I bought 2 bottles of it and I am only 1/2 way through the first after 4 months. I also like that it's an honestly green product (not just "green washing") and its a Canadian product as well! Love it that I can use a 'clean' Canadian shampoo for my daughter's hair. My kids liked the smell and it didn't irritate their scalp. My only complaint is the size. A larger size would be great. It seemed to add some moisture to my daughters hair. This is the only product my niece with very sensitive skin can use. I really like that this product is completely safe for my children. It works into a rich lather and cleans their hair beautifully. Worth it- smells awesome, doesn't tangle, and leaves hair soft. I love the brand and the smell, but this shampoo is too hard to wash out. And it doesn't condition enough (or makes a conditioner very necessary). Didn't irritate my daughter but still wouldn't buy it again. Very drying. Made conditioning even more necessary than usual. Smell good and ingredient is no harm to kids. Son love it! But I found the price in somewhere is cheaper than here. I bought this shampoo for my kids because I wanted to avoid sulfates. We also bought Jason Naturals Kids Only Detangling Shampoo as well. Of the two, this one smells better. The squirt top is very convenient as well. Rinsing causes no tears, even with my 18 month old toddler who doesn't get the concept of closing her eyes when I rinse. Recommended. This is the only thing we use on our daughter. We made the switch to Green Beaver two years ago when Johnson Johnson's baby shampoo kept giving her scalp rash. Love it. And we now use it on our newborn right from day one. The smell is heavenly as well. i love this product!!! it smells lovely and though it doesn't feel as soft on my daughter's hair while washing as other shampoos do, her hair feels clean and soft afterwards. and i love knowing that i'm not washing her hair with a bunch of chemicals! Our kids love this. Nicely scented with a fun pump bottle for the kids. The pump makes it easy to get shampoo when our hands are busy with one of the kids. I love this stuff. It smells so nice. It's a bit hard to rinse out though. that's my only issue. Love the brand though. Great job! I love this shampoo and so does my daughter. It smells great and I love that it's all natural. I will be buying it again for sure.